Slug is a NSLU2, running Debian GNU/Linux. 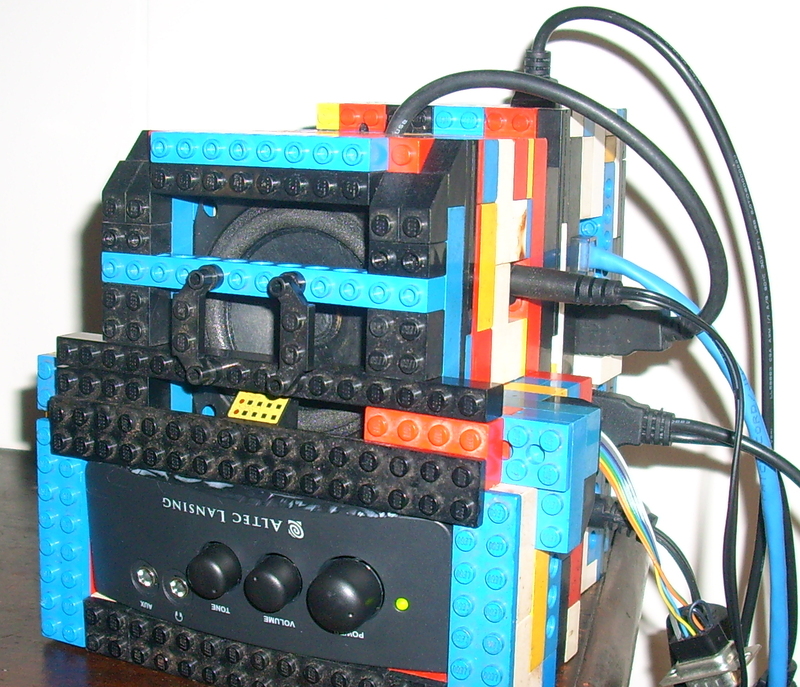 It plays music using mpd. I built the computer, its disk drive, an amplifier, and a USB sound dongle into a lego speaker case. The two components split apart, so I can disconnect the speaker and take the computer with me. I left slug in its case inside this lego shell. It fits in quite firmly, but can also easily be slid out. The disk drive is located behind the computer, as far away from the speaker magnet as possible. 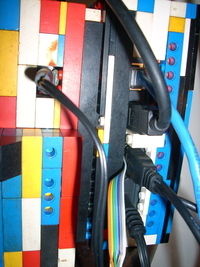 USB cables turn out to fit it with legos quite well, so the drive cable seen here can easily be inserted and removed. I used lots of blocks with holes in them to ventilate the computer and drive. It seems to run nice and cool. Except for the guts of the speaker/amp, I left all the cables exposed for easy access. The amplifier power supply, seen at the left, happened to wege into its hole nice and firmly. No, it hasn't scorched that block above it, that block was already that way. 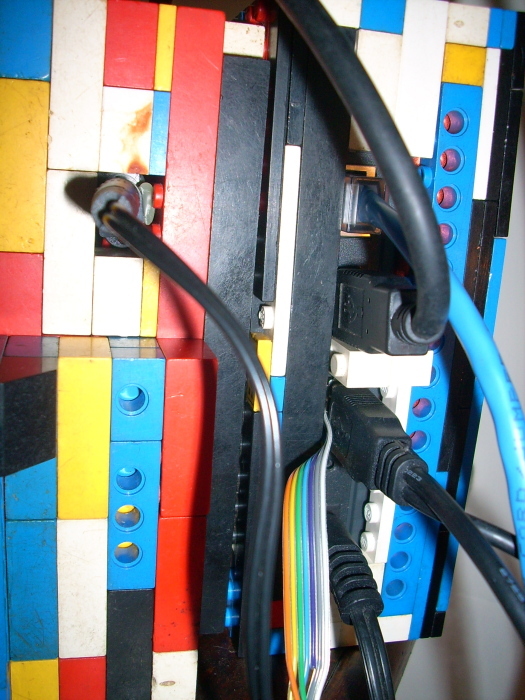 :-) Also seen here is the join between the two parts of the case, where I used some flat-topped lego blocks to make it always "break" apart in the same place. Not shown are the power bricks and power cables, which are still somewhat of a mess. My future plan is to get some more lego (I'm nearly out!) 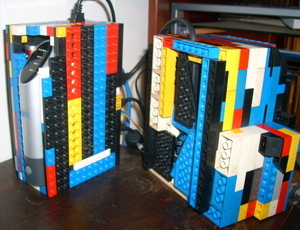 and make a power block that holds both power bricks, and can be attached to the bottom of the current case. 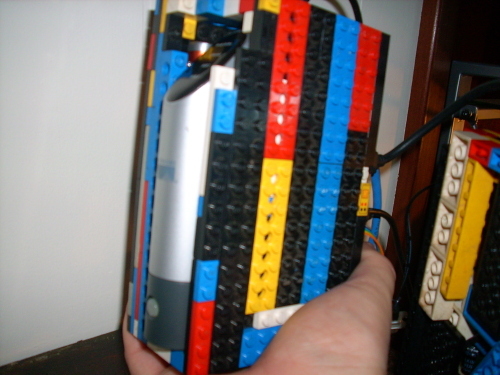 I also plan to do a power block that contains a battery (or very small UPS), usb hub, and usb wifi dongle. Then I will be able to swap in that block and have a portable, wireless speaker. One thing it's definitly missing is controls. I used mptoggle from mpdtoys to make the slug's power button start and stop playback of music, but all other control, aside from the volume control has to be done from a laptop. Adding a LCD panel and some form of controller would be nice, but probably won't happen. 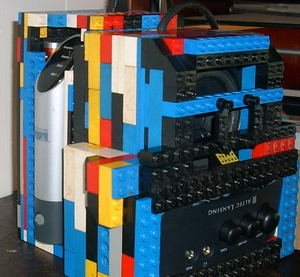 This is mostly "just" a speaker.